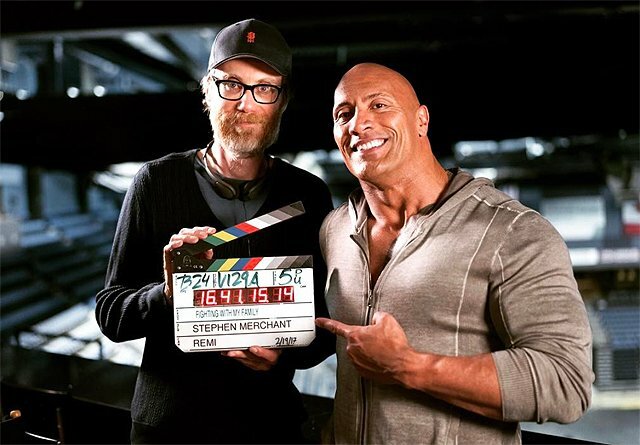 Dwayne Johnson has revealed (via Instagram) that principal photography has officially commenced on the real-life wrestling comedy/drama Fighting With My Family. The film, which will shoot in Los Angeles and London, started at the Staples center for a Monday Night Raw shoot. Check out photos of Johnson, Florence Pugh and director Stephen Merchant in the gallery below! The cast also includes English actors Lena Headey and Nick Frost as Julia and Ricky Knight, parents of WWE Superstar Paige. Johnson will play a role in the film, along with rising star Florence Pugh, who will play WWE Superstar Paige, and Jack Lowden, who will play her brother, Zak. Vince Vaughn will portray an 80’s wrestling star who squandered his money and opportunities. Stephen Merchant (The Office, Hello Ladies) will write, direct and executive produce Fighting With My Family.